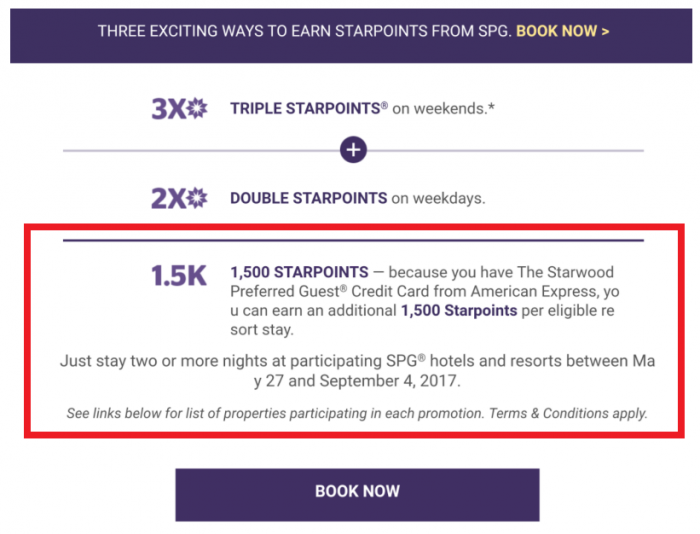 Starwood Preferred Guest (SPG) yesterday launched their “Take Three” promotion (read more here) that is valid for stays minimum of two nights between May 27 – September 4, 2017. Seems that there is at least one additional targeted bonus offer around. The targeted bonus is 1,500 bonus Starpoints for stays at resorts that you earn in addition to the double or triple Starpoints under the generic version of this offer. Members that have SPG Amex and are targeted for this offer can earn an additional 1,500 bonus Starpoints for stays at participating resorts (minimum two nights). You don’t have to settle using SPG Amex. This is nice additional bonus for those that can take advantage of this offer and stay at any of the participating resorts during the promotional period. SPG Credit Card Offer: The Starwood Preferred Guest® Credit Card from American Express Card Members (“SPG Card Members”) who register for the SPG Take Three Promotion before the registration deadline will earn 1,500 Starpoints for eligible stays of two or more nights during the earning period at certain SPG Resorts that are participating in the SPG Take Three 3X and 2X promotion. Click here to view the complete list of resorts participating in the SPG Credit Card Offer. Not all of the SPG hotels and resorts that are participating in the 3X and 2X promotion are also participating in the SPG Credit Card Offer. Check both the list of Hotels and Resorts Participating in the SPG Take Three 3x and 2x Promotion and the list of Resorts Participating in the SPG Card 1.5K Bonus to determine whether a property is participating in a particular offer before making your travel plans. An SPG Card Member may not receive the 1,500 Starpoints bonus if the Card Member completes an otherwise eligible resort stay less than 5 days after being approved for The Starwood Preferred Guest Credit Card from American Express (an “SPG Credit Card”). To receive the 1,500 Starpoints bonus, new SPG Card Members should allow 5 days after SPG Credit Card approval before completing an eligible resort stay. Payment with an SPG Credit Card is not required.